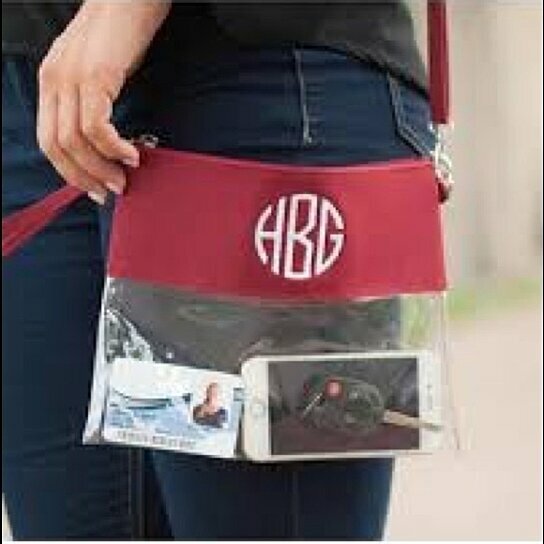 Personalized Monogram Clear Stadium/Game/Tote/Crossbody Bag . Please select an option Circle Vine monogram Script Please select a Font. Thread color - please specify the color you'd like for the monogram.Clear Plastic Body. Polyester Trim. Zipper Closure and Stadium Friendly. 10" L x .5" W x 7.5" H.
You can Make monogram of you first , last and middle name or you can make Only First name. Pls choose Script font for First name on the bag. For monogram choose from Circle and Vine( interlocking) Fonts.